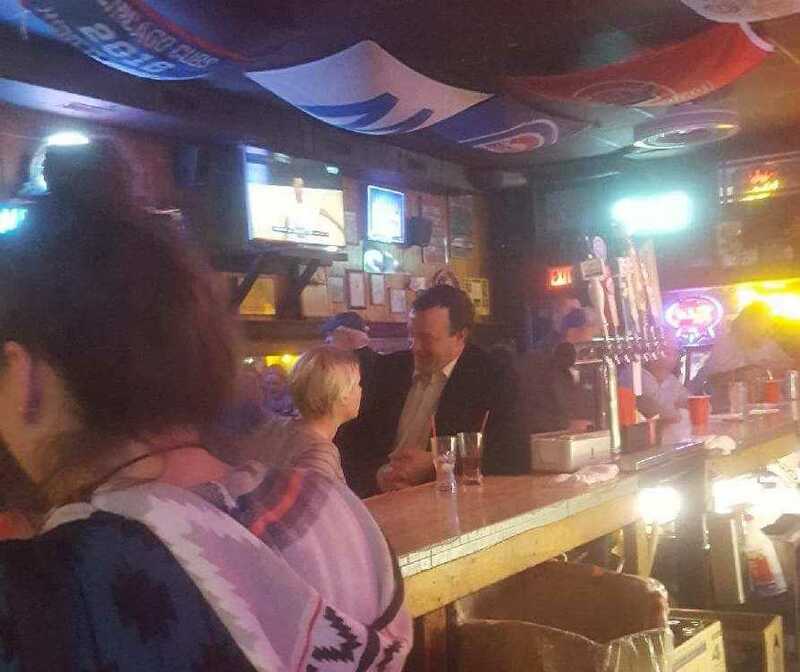 A video recently obtained by Iowa Starting Line appears to show Senate Majority Leader Bill Dix in a romantic relationship with a Statehouse lobbyist while out at a Des Moines bar. 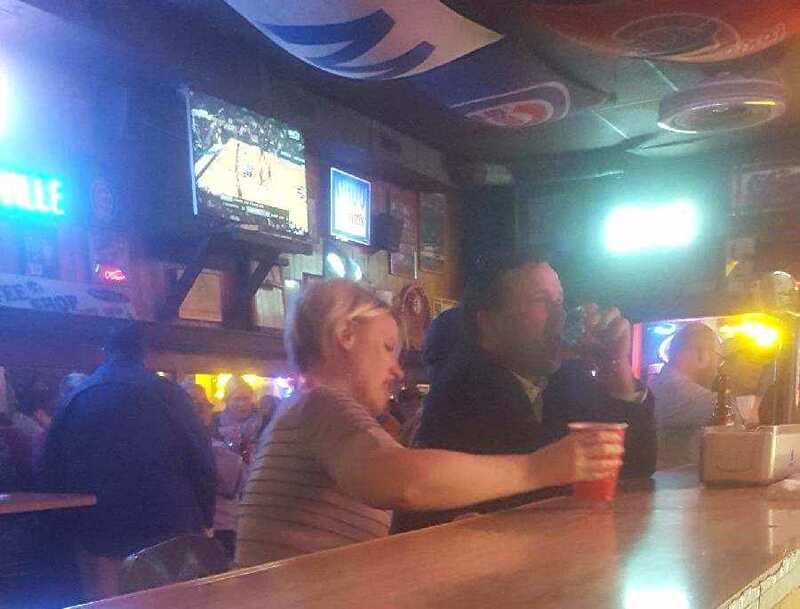 The evening the two were together happened on Thursday, March 1 at Waveland Tap on University Avenue. The people who captured the moment on their camera phone say they recognized Dix from media reports, including those surrounding the Senate Republican sexual harassment trial and settlement. They observed Dix flirting with and occasionally kissing a younger woman at the bar in the evening. They are not affiliated with a campaign or party organization, but were members of the general public who happened to see the scene while at the neighborhood bar. Here is the video – the more relevant parts occur near the end. (Starting Line edited out half a second of footage where you briefly see part of the people who recorded the video – they requested anonymity). The woman in the video has been registered and works as a lobbyist for various municipality groups at the Statehouse for the past two years. It also appears to be the same black suit and white shirt combination that Dix was wearing earlier in the day (sans tie). Starting Line spoke with several people at the Waveland Tap this Saturday. 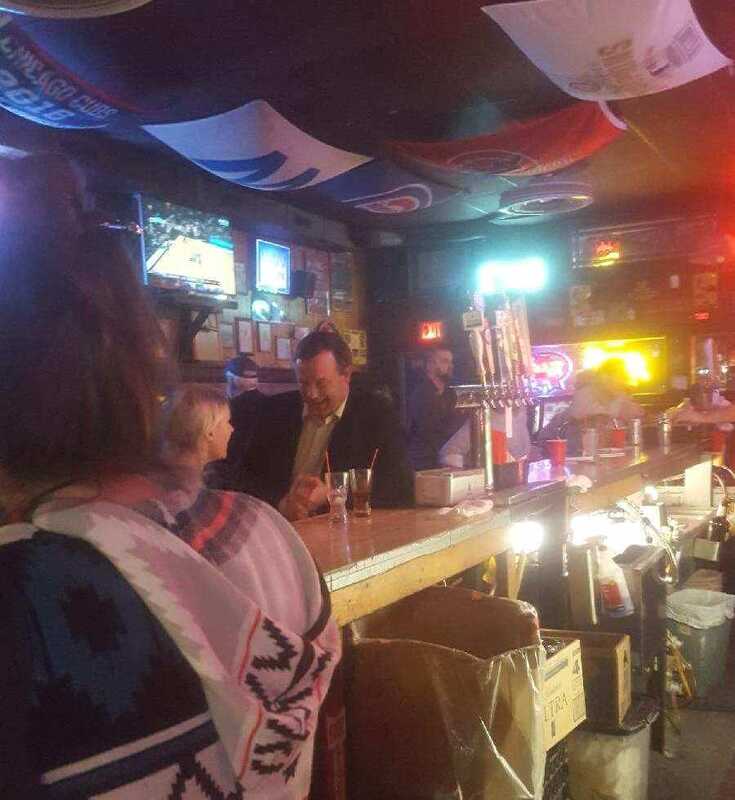 They didn’t recall seeing someone who looked like Dix at the bar recently, but they also weren’t there on that Thursday evening. The bar is, however, a regular hangout for several lobbyists, and bar patrons Starting Line spoke with said they’d seen senators in there before. Senator Dix’s office declined to comment. The lobbyist in question declined comment when contacted by Starting Line this morning. 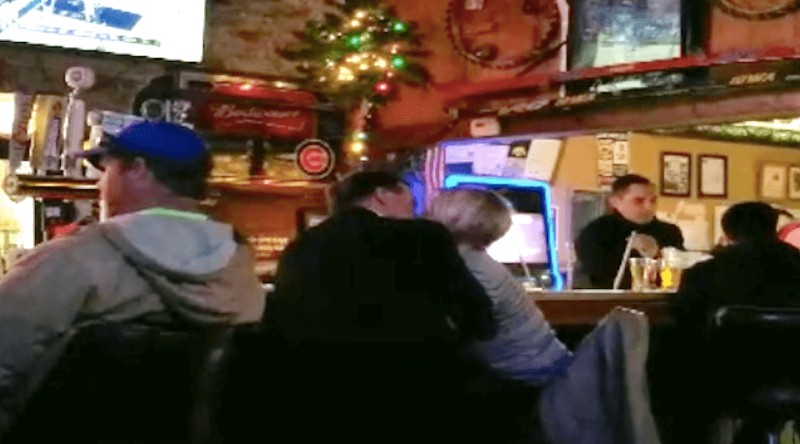 The moment at Waveland Tap came just weeks after legislators and staffers at the Statehouse conducted a new sexual harassment training. It also came months after Iowa taxpayers were put on the hook for a $1.75 million settlement from the Kirsten Anderson lawsuit. Senator Dix has come under significant scrutiny for his role in firing Anderson hours after she reported a toxic work environment and for continuing to insist he did it solely for job performance reasons. He faced a call to resign from one member of the Republican caucus after the initial $2.2 million jury verdict was handed out. He weathered further outrage and calls for him to step down when he refused to make public Senate Republicans’ internal investigation into the matter (they later released it over the Thanksgiving holiday, and the report seemed to contradict some of Dix’s public statements about it). Late last year, the Iowa House and Senate hired a human resources director to handle sexual harassment issues. Dix himself also brought in former Ambassador Mary Kramer, who once served in the Iowa Senate, to advise on changing the “workplace culture” of the Iowa Capitol. Those efforts seem to have had little impact, according to Katie Ervin Carlson, an Iowa attorney who specializes in workplace employment and sexual harassment matters. “This footage would suggest to me that the sexual harassment training was not effective, at least not for Mr. Dix,” Carlson said after viewing the video. She didn’t have an opinion on whether the scene constituted any actual legal issues, but said that a senator placing himself in such a situation could lead to conflicts of interests and consequences down the road. As senate majority leader, Dix isn’t just a vote in the Iowa Senate – he can decide which bills come to the floor in the first place. For a lobbyist pushing certain legislation, that person holds considerable power over their job. Whether or not Dix and Senate Republicans find themselves in more trouble with sexual harassment issues, just public knowledge that a senator was engaged in a relationship with a lobbyist over whom he has significant power could impact future cases elsewhere. “If I were representing the next Kirsten Anderson and making claims of sexual harassment, a hostile environment or retaliation up at the Statehouse, I would certainly use this as exhibit one that not only is it still being allowed to go on, but two, I think it makes claims more credible,” Carlson said. Carlson also questioned whether Statehouse leaders would ever change, considering there was a huge public relations fallout that resulted from the public trial and settlement and senators still appear to be acting in this manner. “I mean, what does it take?” she asked. A politically inappropriate relationship and absolutely wrong since he is married, but I don’t get the harassment part. Why wasn’t the lobbyist identified in the story? It seems very relevant to the story. First of all good riddance to Dix. Legislative assistant in the Iowa Senate, Jan.-May 2015. Contract attorney for Beacon Hill Legal, Feb.-July 2014. Legal website content writer for FindLaw, Jan. 2012-Nov. 2013. Judicial law clerk for the Dakota County District Court (MN), Dec. 2009-Sept. 2010. Attorney at Fredrikson & Byron, P.A., Sept. 2007-April 2009. International programs coordinator at the Iowa Council for International Understanding, March 2003-March 2004. Program analyst for Popluation, Health, Nutrition Information Project, Nov. 2001-Nov. 2002. J.D. from University of Iowa College of Law, 2006; B.A. in journalism, French from University of Iowa, 2001. She looks like a willing participant to me. Not harassment but definitely wrong. What’s new? Just another self-serving low-life scumbag politician! Aren’t they all pretty much the same. Just haven’t been found out yet! No. Republicans have the lock on unethical and scummy behavior. I disagree with you Mark that republicans have the lock, as you characterize it, on unethical and scummy behavior. People of any affiliation have an equal propensity for unethical or sinful behavior by any standard I would say without mentioning democrats or others by name specifically. I don’t agree with Dix’s behavior, but how does that separate him from so many democrats or any other group you might pick I would ask you? No – not all politicians are the same anymore than all plumbers, teachers and attorneys. Unfortunately bad behavior exists everywhere so prize those in your own family, friends, co-workers, etc who do behave properly. Is this guy DIX named right, or what? Just more Trump like behavior by a typical republican politician. I am glad to see him go, and feel very sorry for his wife and children, as well as the citizens of Iowa who have to pay for lawsuits brought on by people like him in the Republican party. It is unfortunate that the taxpayers of Iowa have to pay for sexual harassment lawsuits brought on by repugnant republicans like Dix and the fat orange monster in the White House.